If you want an extraordinary getaway that will tip your world upside down, Ripley’s Odditorium is the perfect destination for you. It stands 10,000 square foot wide just near the International Drive at Orlando, Florida. Discover the most bizarre and unbelievable historical facts with its 16 unique galleries and amazing artifacts. Take your time as you explore at your own pace each and every exciting corner of this odd museum. Ripley’s Believe it or Not! Orlando Odditorium is oozing with weird facts that will leave your jaw dropping with amazement. Marvel at it sink-hole like architecture, down to the dozens of new fantastic exhibits of unusual art, and unique genuine artifacts from all around the world! It is only here in Ripley’s Odditorium where you can see a collection of the most unusual animal relics. You will see animals with extra limbs such as the 7-legged sheep, animals that are extra-long like the 8-feet long fish and an 8-feet long stuffed alligator gar, and fossils of an extinct animal like the T-Rex. A variety of fun and interesting works of art are also available. Feast your eyes on these awesome creations such as the miniature terracotta Asian warriors, and other miniature arts that visitors can view with a magnifying glass. There are also wax figures where you can take a picture with and show-off back home. Another interesting piece is a dog sculpture that is totally made of clothes pins. Hollywood inspired art displays are also present like a “Wall-E” robot replica made from car parts, an amazing portrait of Beyonce that is made entirely from candy, and a towering 25-foot high mural of Jimi Hendrix made from at least 8,500 playing cards. Aside from the weirdest displays and art creations, Ripley’s Odditorium also showcases some of the world’s most remarkable technological and historical entities. One is an actual shrunken human head that is less than half of the size of a normal adult human. Another one is a Peel Trident car which is the smallest production car in the whole world. You will also see a balloon-powered chair that flew over the Rocky Mountains. A lot of other amusing wonders can be seen in this museum. New word puzzles, brain teasers, and optical illusions are here to make your brain cells rumble. You and your family can also enjoy in the new shooting gallery wherein you can take aim and fire at different odd targets. Are you ready to discover the weirdest things that this world has come up with? Then visit Ripley’s Believe it Or Not! 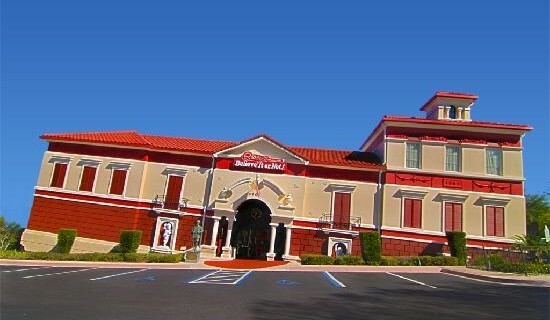 Orlando Odditorium and brace yourself as you learn about the world’s most bizarre artifacts. A day’s tour inside Ripley’s Odditorium will cost $16.99 (13 yrs. Old and above) for adults and $10.99 for children. You can also avail of a museum collection book for only $1.99. The museum is open in all days of the year. Been to quite a few Ripley’s over the year including Blackpool & London UK but Ripley’s Believe it or Not! Orlando Odditorium is huge with so much stuff in its unreal. If you have a real interest in the weird and wonderful, set aside a good few hours to take you time and enjoy.